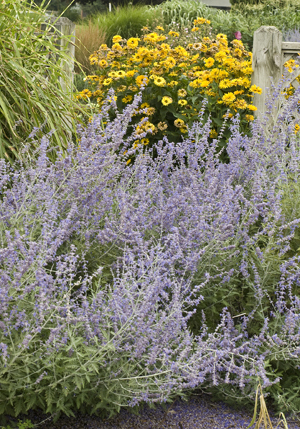 What are you looking for in a perennial? Something that works in shade? Is deer resistant? Attracts butterflies or humming birds? Find perennials in those categories and more at the 49-cent perennial sale to be held from Friday, April 22 to Saturday, April 30 at Mischler’s Florist and Greenhouses, 118 South Forest Rd., Williamsville. Hours are 8 a.m. to 5 p.m. Monday through Friday, 9 a.m. to 5 p.m. Saturday and 10 a.m. to 4 p.m. Sunday. People often ask whether they should keep their perennials in the house until they’re ready to plant them. The answer is no. The sale perennials have been hardened off, which means they were introduced to colder temperatures for several weeks. More than 100 varieties of plants will be offered in the sale. 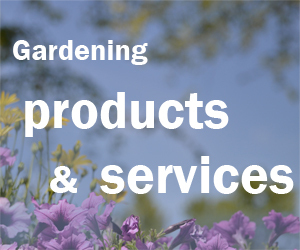 You can download the list of plants that will be offered here. Here are a few plants that are new to the sale this year. 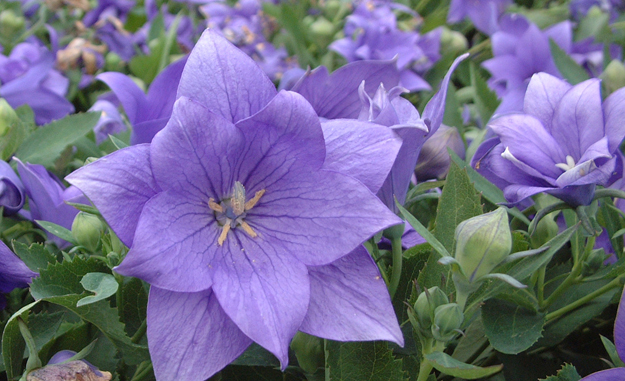 You may be familiar with balloon flowers. They get that name because before the flower fully opens, the bud is round like a balloon. This variety is interesting because it has double flowers; that is, there is an extra set of petals behind the first set. Mischler’s has it in three colors: There is ‘Astra Double Blue’, ‘Astra Double Pink’ and ‘Astra Double White’. The plant also attracts butterflies and is somewhat deer resistant, said Mark Yadon, vice president of Mischler’s. 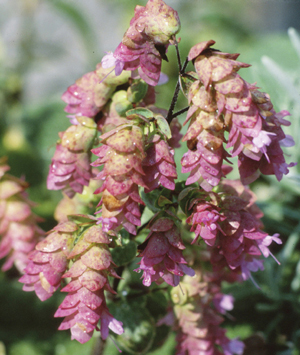 Western New York gardens are in Zone 5 or 6, and this plant is hardy down to the colder Zone 3, so it’s dependably hardy. This is a plant that would work well as an accent plant in containers as well as in garden beds, Yadon said. 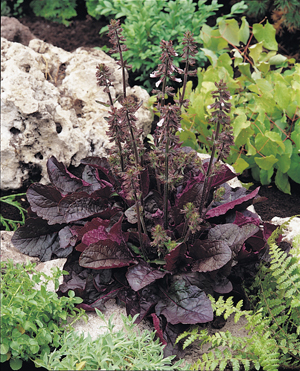 It has very dark red, purplish foliage that contrasts well with its delicate white flowers. You can combine this plant with annuals in a container. In the fall, plant ‘Purple Volcano’ in your garden bed and it will come back every year. Consider using other perennials in your container plantings as well. For example, Yadon suggested using artemesia ‘Silver Brocade’ as a substitute for the annual dusty miller. Ornamental oregano or origanum rotundifolia. What’s cool about this plant is the flowers. They resemble green and pink pine cones. It’s quite lovely. This is a popular plant that you can see in many gardens, but this is the first time Mischler’s has had it in the 49-cent Perennial Sale. I have it in my garden. The plant has the lovely scent of sage and gets purple flowers. Yadon pointed out that this is a late blooming plant, so it’s a good choice if your garden needs a little interest later in summer. It attracts butterflies and is deer resistant. Make a List: The list of available sale perennials is on the Mischler’s website. Print it out before you go. You can also pick up a printed list when you get there. Highlight the perennials that interest you so you can locate them more easily. Bring a Pen: Check off each variety as you make your selection. It will be crowded and it may be helpful if you don’t have to backtrack. Carpool: Parking spaces are at a premium. Sharing transportation with a friend or relative can help reduce the overall traffic and increase parking availability. Where to park: As you approach Mischler’s parking lot entrance, one of their employees will do their best to direct you to an available space. If you choose to park on South Forest Road or adjacent side streets, they ask that you be considerate of residents’ property and not block driveways or park on lawns. Also be careful not to park too close to any corner, which would block crosswalks. Be prepared to walk, perhaps several blocks. If you transported your purchase to your vehicle using one of their carts, they would appreciate its return to their lot. Bring Your Own Wagon: Their shopping carts will be at a premium. To prevent waiting for an available cart, you might consider bringing a wagon or cart of your own. Carrying your purchases: Corrugated cardboard trays are available in multiple locations throughout the sales area. Placing your perennial sale packs directly in these trays will help save time at checkout. Is the Zone column on the plant list correct? Why would there be plants on the list which are not perennial for our area Zone 5-6? I’m confused. However, I would like to be on your email list. I am a member of Buffalo and Erie County Botanical Garden and like to play in the dirt but not too knowledgeable about planting for Zones and light conditions.I have purchased from your greenhouse in the past, sometimes with successful results but not always.